Law enforcement officials execute a search warrant in Menlo Park (September 15, 2016). Teaming up with an FBI swat team, the Menlo Park and East Palo Alto Police Departments executed a search warrant Thursday morning on the Peninsula. 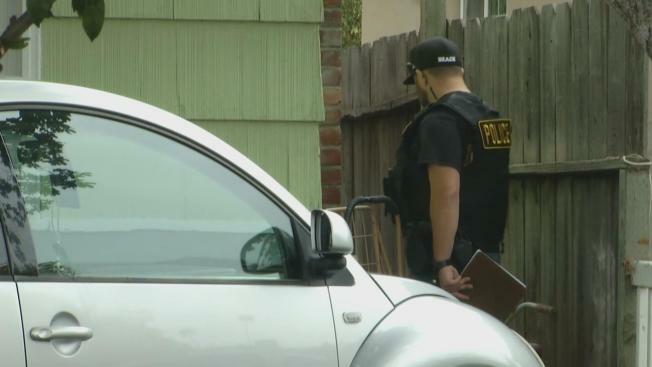 The original search warrant was filed in connection with a firearms and gang case that the Menlo Park Police Department had been investigating, police said. Law enforcement authorities conducted the warrant in the 1300 block of Sevier Drive in Menlo Park at approximately 5 a.m., according to police. One suspect is currently being questioned by police, but several other people in the home during the warrant execution have been released. Upon investigation, the house has been deemed uninhabitable because of health and safety violations ranging from altered living spaces along with electric and gas system modifications, police said.